Starting to feel like I’m making progress with the Insanity Asylum workout. Only took a couple small breaks while doing the Strength Workout today. 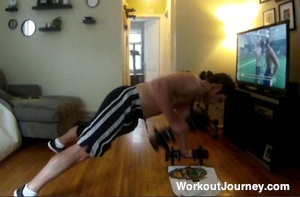 Used a little bit more weight when doing the curl, squat, drop down, push up, spider move thingy, and run it out. Paused one time during the last set to make sure I did get in all 5 reps. Still had to wear my knee brace but it was not hurting me as much. Thinking that with practicing good form since the beginning that the muscles around my knees are strengthening up. This is good news. When I watched my YouTube video I can see much better form through each move and a little quicker pace. This is just a blip of the entire 50 minute workout so you can see what it looks like. Felt a lot stronger at the end and nothing hurt. Was sweating like crazy but that’s a good thing. Really liking the Strength Workout.